Are you looking something more aesthetic to complement your property? Overwrought have now firmly established themselves in the sliding gate market with impressive examples in both domestic locations and industrial sites. Attention to detail and an involved workforce has resulted in Overwrought constantly going forward with new ideas both in the design and manufacture of the gates as well as improved installation techniques. Although we tend to specialise in cantilever sliding gates, we are always willing to discuss alternatives as not all locations may suit this system. It is most important to establish that there is sufficient space to slide the open gate into - a rough guide is the opening width plus 40%. Overwrought has for some years been involved in bespoke manufactureof a range of ironwork products and it is this experience that has allowed us to incorporate individuality into what may otherwise be an ordinary sliding gate. The result is that Overwrought have been asked to carry out quite prestigious projects all over the country. One of the main reasons that we have established ourselves in this competitive market is by working with the client to provide an aesthetic and reliable product. 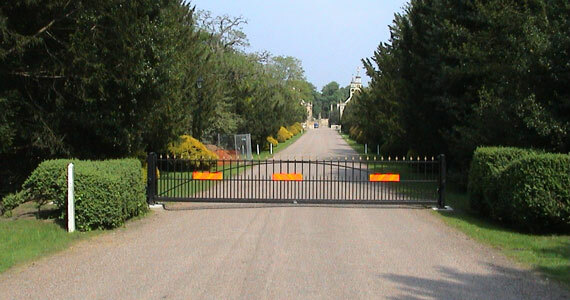 This has been achieved by paying attention to design as well as galvanising all gates prior to painting and then matching the gate with a reliable automation unit and entry system. We always ask for the client's own electrician to supply power to an isolation box near to the site of the cantilever frame. All details for the groundworks will be supplied should the client be in a position to install the concrete base pads themselves. Although installation and automation are usually kept in-house, there are occasions when we will supply a gate for a recognised installer or gate automation company to complete the project. We only ever let anyone else install our gates when we are fully satisfied that they will carry out the work to the highest standard.